Bipolar disorder brings unexpected, even frightening extremes, especially for children. 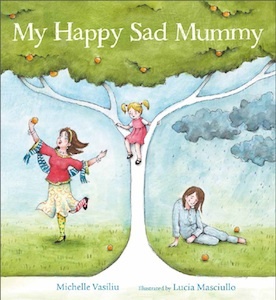 My Happy Sad Mummy tackles this difficult subject from a little girl’s point of view and in doing so, opens up a space for little ones to talk about their experiences. Sometimes Mummy is so happy she laughs and talks all day. She can be so full of energy that she doesn’t want to sleep, even when it’s way past bedtime. Sometimes she is so sad she doesn’t want to get out of bed. Then she doesn’t notice her family. Lucia Masciullo’s illustrations complement Michelle Vasiliu’s text to perfection, showing how life can spin out of control, especially in the manic moments. My Happy Sad Mummy is a precious resource for counsellors and children’s services and an absolute treasure for families affected by bipolar disorder. Having grown up myself with a mum who suffered from bipolar disorder, this gentle insightful book would have made a world of difference for both Mum and I.